(L-R) Keith Hampson, Bert Biggs, Martin Reid, Tom Fisher, John McCarthy, Louise Quinn. 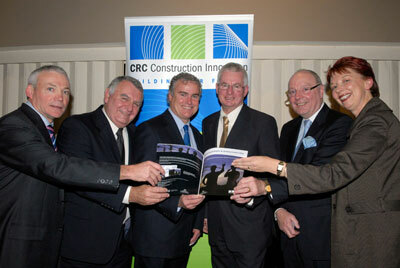 The Cooperative Research Centre (CRC) for Construction Innovation, with support of the Office of the Federal Safety Commissioner, has produced a new safety guide to improve safety on construction sites by providing a consistent, national approach to implementing safety leadership in large and small organisations. Fatality rates in the building and construction industry are twice as high as the national average. “People are dying on the job,” Dr Keith Hampson, CEO of the CRC for Construction Innovation, said. A Practical Guide to Safety Leadership – has been developed as a step-by-step tool to implement the award-winning Construction Safety Competency Framework. The original framework, developed by a national industry, government and research CRC team led by Mr Dean Cipolla, Group Safety Manager of John Holland Group, promotes a consistent approach to improve OHS competency for key safety positions by outlining “who does what” and the competencies required to equip staff responsible for safety leadership in their organisations to perform these tasks. A Practical Guide to Safety Leadership, which is available for free download, is designed to be used in conjunction with the Construction Safety Competency Framework. The Federal Safety Commissioner, Mr Tom Fisher, who launched the guide in Canberra on 24 June, said OHS initiatives such as the guide were vital to bring about sustainable cultural change in the industry. “If senior managers can plan, implement and adopt good OHS practices as part of their business planning, it will set the wheels in motion for the change that is needed,” Mr Fisher said. A Practical Guide to Safety Leadership contains the tools and information to enable both large and small companies to do precisely this. The guide outlines information on safety critical positions and safety management tasks required to achieve a positive safety culture. This includes practical information and case-study examples for companies to implement the framework on a step by step basis, including a checklist of steps that can be followed so that companies can customise the framework to meet individual organisational needs. The guide contains case studies from small and large organisations that have customised the Construction Safety Competency Framework within their organisations. For example, St Hilliers used the framework to audit position descriptions and site safety management plans within their company, to ensure that all appropriate safety management tasks were incorporated. The company developed a skills matrix with nine competency clusters. Bovis Lend Lease, who participated in the development of the original Construction Safety Competency Framework research, customised the safety critical positions outlined in the framework to add in cost planners and contract or finance managers, which the company considered critical to its safety performance. Bovis Lend Lease’s customisation of the framework not only provided consistency in environmental health and safety training across the organisation but also generated a comprehensive review of all environmental health and safety content in the roles and responsibility descriptions and sections of its management system. Laing O’Rourke used the framework as the basis of a training and development program for foremen/supervisors, junior engineers and site safety advisors. Baulderstone Hornibrook used the framework as a point of reference to undertake a ‘gap’ analysis of current training and staff development activities on a national level. Martin Reid, Construction Manager of the Albury-based Joss Group which has an annual turnover of $130 million and a workforce of 60 people, spoke at the launch of the guide from the perspective of how small to medium sized construction companies could utilise the guide and implement the Construction Safety Competency Framework in their organisations. The Joss Group participated in industry focus groups, as part of the development of the guide. Mr Reid said Joss Group, and other medium sized companies, operate in an environment where they maintain all the pre-qualifications, accreditations and safety management systems that large companies maintain but without the same depth of resources. “We compete with builders working out of the back of their utes who have negligible overheads – and the large majors who have large turnovers to spread overhead costs across,” Mr Reid said. Mr Reid said the involvement of industry leaders such as Bovis Lend Lease, Hornibrook Baulderstone, John Holland Group and others in the development of the guide was a bonus for his organisation. “It means the information in the guide is peer-reviewed and the fact that these industry leaders have implemented the framework is a significant endorsement of its content,” he said. Mr Reid said Joss Group would like to see the CRC’s safety research taken to the next level. A Practical Guide to Safety Leadership contains an implementation checklist and the tools and information required for companies to similarly customise the competency framework to suit their organisational needs. The guide can be downloaded free of charge from the CRC for Construction Innovation or hard copies ordered online.